Things are getting seriously sparkly over at Mecca Bingo, where all week the site is hosting the Blinging Bonus Back promotion. This star-spangled special offer is treating every player to 20% bonus back on every cash stake they make. If you fancy taking part in the Blinging Bonus Back promotion, you will need to stake at least £20 of real money on any of the qualifying slot games listed above. Before staking your cash, make sure you enter the promo code JEWEL into the ‘My Bonuses’ section of your account. Once you’ve completed these simple steps, all that’s left to do is start spinning the selected slot games and you will receive 20% of your cash stake back in the form of bonus bucks. The first game that qualifies for the Bligning Bonus Back promo is Jewel in the Crown by Barcrest. This is a 10 pay line slot with five glimmering gold-framed reels filled with gemstone symbols. 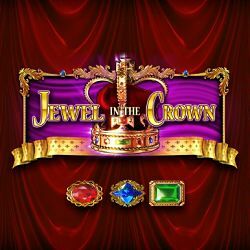 Jewel in the Crown in playable from 10p to £500 per spin and stands out for its generous free spins feature and Big Bet option. The Big Bet feature in this slot gives you the chance to pay a bit extra for five linked spins packed full of exciting bonus additions. Jewel Strike Action Spins by Blueprint Gaming has a fixed amount of 10 pay lines and can be played for as little as 20p and as much as £25 per spin. The symbols in this slot are suitably sparkly jewels. Playtech’s Crown Gems is a five reel, three row slot with 10 fixed pay lines. This game is gorgeously designed with starry symbols set against an intergalactic backdrop. The most exciting thing about spinning the reels of Crown Gems is the Hi Roller feature which gives you a shot of playing five extra spins, each one with 50 active pay lines. Next up it’s Gemstone Jackpot by Novomatic. Treat yourself to a go on the 10 pay lines and five reels of this glimmering game and you’ll be blown away by the never-ending array of beautifully drawn gemstones like diamonds, emeralds, rubies, topaz, sapphires and amethysts. The detailed artwork in Gemstone Jackpot is impressive but the real jaw-dropper is the top jackpot of five million coins waiting to be won by one very lucky winner! Finally, Reel King Potty is a five reel, 20 pay line slot by Novomatic. This regal game can be played from 20p per spin and features two very impressive bonus features. These extras offer multipliers of up to 500X your stake. All registered members of Mecca Bingo based in England, Scotland or Wales are welcome to take part in Blinging Bonus Back. The promotional period runs from the 10th until the 26th of March and only gameplay made with real money during this time will qualify for the 20% bonus back. It is important to note that all winnings made with the bonus funds earned through this promotion will be subject to a 20X wagering requirement.